There is nothing more irritating than a large pantry shelf with items all jumbled into it. Decorative metal storage bins can help take care of this problem. Primarily made of metal wire, they make it easy to group like things together, to keep cans and cartons upright and to make sense of your prepping cupboard so the zombie apocalypse won’t find your major necessities buried under an obscure mound of trivialities. Or, as one charming young woman put it, it isn’t really so much about a zombie apocalypse as about that potential job loss, or the sudden price hike at the supermarket – but where is the drama, excitement and incentive in that? There is nothing better than two or three sets of metal stacking baskets to get like things stored together in your pantry. The wire baskets allow the contents to be visible, and the dropped lips of the stacking baskets make it easy to access that box of instant pudding or envelope of gravy mix. No more confusion when searching for spices, powdered drink mix, tea or coffee – it is all sorted and kept at hand. The bathroom is one of the busiest rooms in the house, and one of the places where just about everyone in the household wants to store some of their stuff. Plastics tend to hold moisture, which can promote the growth of things better left unnamed. But a wire mesh basket keeps items organized without accumulating moisture. If privacy or restraint of small items is desired, add a snap together or tie on cloth lining to the baskets. Fill them with the right items and wire mesh baskets can be ornamental as well as useful. There is nothing more attractive in a kitchen than a well-filled fruit basket, whether it is a two or three-tiered standing basket or a hanging basket that is suspended from the ceiling. Keep your sewing notions or patterns organized by placing them in a bin near your sewing table. Below find ten decorative metal storage bins for your enjoyment. Organize your pantry with stackable pantry baskets. Put an end to disorganized pantry shelves that seem to have all your dry goods tumbled together with these stackable wire baskets. Sturdy, easy to see what is stored in each, these can keep your Jello boxes separated from the Kool-aid and yeast packets. Cooking just got a lot easier because you can find your ingredients. Place it in the entryway for incoming mail or tuck it on a shelf to keep small items contained. The wire structure makes it easy to peer in and see what is inside. No more worries about the plumbing fixtures becoming mixed up with the pudding packets because these baskets can easily keep items sorted. Keep your pantry shelves tidy with wire storage baskets. No more struggling to keep the lemons separated from the onions or struggling to store potatoes so that air circulates around them. Nothing to install, no screws, no wires – just place the basket on the shelf and load it with your stuff. You can easily locate it, too, because everything is visible through the wire. 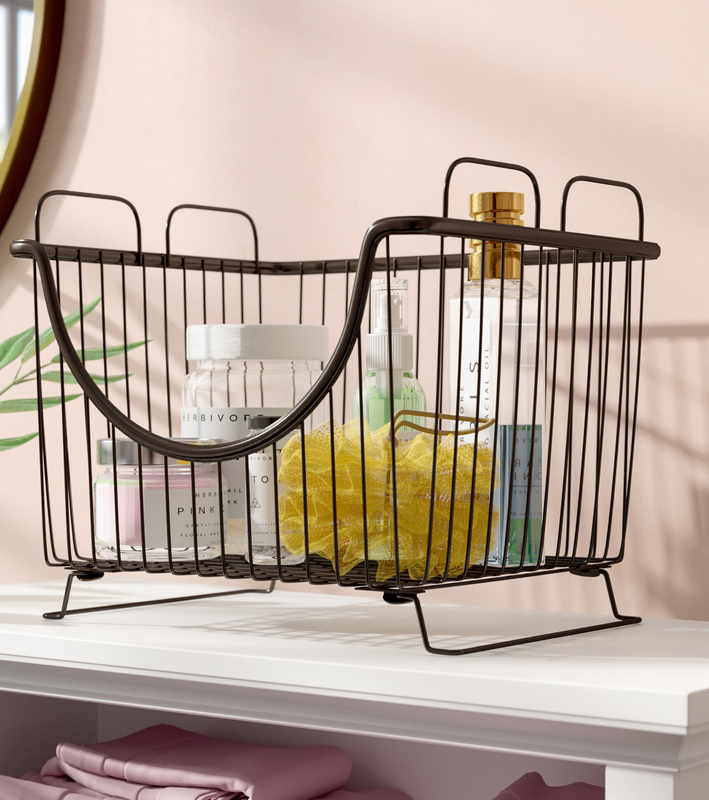 From laundry supplies to garden vegetables, it is hard to beat a vintage large metal wire basket from Rebrilliant for those many little jobs around the house that can use some informal storage space. No more searching in the backs of cupboards or in the dark spaces under the sink to find the items needed. What is better than one metal basket? Three stacked metal baskets. This Three tier metal sorting basket set is perfect for vegetables, fruit, or potatoes in the kitchen. But it can also be used for patterns and supplies beside your sewing machine, or even for small reference materials in your office. It’s light and easy to move, but sturdy enough not to be knocked over easily. Make the best of that tall, narrow shelving space with narrow stackable baskets. With a powder coat finish and scooped front, these shelves are suitable for any room in the house – from sorting out the mail in the front hall to organizing the laundry supplies in the back mudroom. Art supplies or sponges, they can hold just about anything that will fit and not slide through. Easy to clean, store and install, these mesh storage cubes are perfect for everything from baby toys to a teen’s books and notebooks. With these flexible cubes, you can help your child (or yourself) make sense out of that horrible phrase, “Clean up your room!” Decluttering is so much easier when there is a place to put things. Show off your supermarket and farmer’s market fruit and vegetable discoveries in this three-tier hanging metal basket. Some items, when purchased fresh, just do not take to refrigerator or cupboard storage. Bananas, apples, oranges and more keep best and are most accessible at room temperature – these baskets are great for that. It’s perfect for a kitchen with a cottage or country décor theme. Create a centerpiece or collect garden produce with this two-tiered wire basket with handle. Pile the fruits of your labors high in the basket, producing a pleasing visual effect. The top handle makes it easy to move a centerpiece or garden gleanings without disturbing the basket contents. Also functional for flower arrangements or even to hold potted plants. Keep small items inside your wire baskets with snap on faux linen linings. Easy to remove for cleaning, yet keeps small items secure. Enjoy the sophisticated fabric look along with the sorting and weight-bearing capacity of sturdy wire. It’s great for kitchens, entryways, or gifts. Perfect to store just about anything from incoming mail to small grooming items in the bathroom.